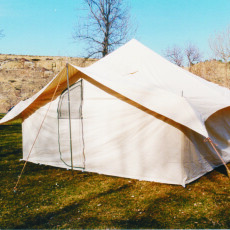 The Big Horn Package is our complete wall tent setup. 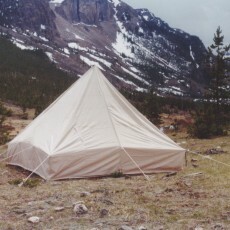 This wall tent package comes complete with a Big Horn Wall Tent, Aluminum Frame, Canvas Floor, and a Rain Fly. The Camp Chef Stove that is shown is available as an add on. Free Bonus – we are going to throw in a 3′ x 5′ stove liner to protect your floor. You can choose between our 10.10oz Marine Treated Canvas or the 10.10 oz Marine/Flame treated canvas. Both fabrics have a breathable “dry” treatment for mildew and water repellency. The Flame Treated canvas includes a treatment meeting CPAI-84, the industry wide standard for flame resistance. If you are new to wall tents or just looking for a complete package without having to “build it yourself” then this one is for you. 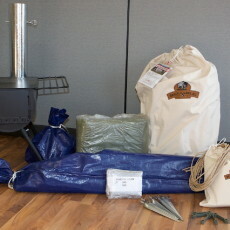 •Bonus: 3′ x 5′ stove/firepit liner free with every package!! !